Most of us own at least one oil painting. It may not be an Old Master but to each of us, it is probably of greater value. You may find this form useful. Complete, print and mail it or send as an e-mail. I will try to give you a free evaluation of your oil painting. When returning the form it will help, if you possibly can, to attach a photograph of your painting. Below, I explain how to prevent your paintings being harmed and what to do if it seems to be damaged or deteriorating. THE OIL PAINTING YOU OWN is more valuable to you than an Old Master. It may be an ancestor's portrait, handed down through generations or a painting that was always in the family. The work of art, should it become seriously damaged or destroyed, can never be replaced. London, Paris, Amsterdam, New York. In these cities, if you own an old oil painting, the principal art museums want to meet you. You will also be given a complimentary consultation and receive advice on the work of art's condition, its state of preservation and suggestions for maintaining it in good condition. Your painting will be examined by a specialist curator, often with an international reputation. Picture owners and collectors who live outside these large centres who seek advice about an old or damaged painting they own, often find this difficult to do. Matthew Moss is the founder of the National Gallery of Ireland's first restoration laboratory for Old Masters and became this major art museum's senior painting's conservator. He has restored the Masterpieces of world renowned Old Masters such as Rembrandt and Poussin, not to mention other world-famous Masterpieces by artists like Goya and Murillo. Matthew Moss, like curators in other famous European art museums, was always ready to meet picture owners who came to the National Gallery requiring council. 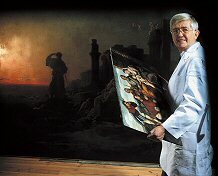 He still continues to provide art-expert guidance to the owners of oil paintings. MATTHEW MOSS in his conservation laboratory. In the foreground, Bernardino Lucinio (sixteenth-century Italian school) Adoration of the Shepherds and, Background, Gustav Doré (1825 - 83), Rest on the Flight into Egypt. Matthew Moss will make a one-time evaluation of an old oil painting in your possession. You will receive advice on the work of art's condition and state of preservation and suggestions about maintaining it in good condition. To benefit from this offer, please complete and submit the form. Matthew is the author, also, of Caring for Old Master Paintings. 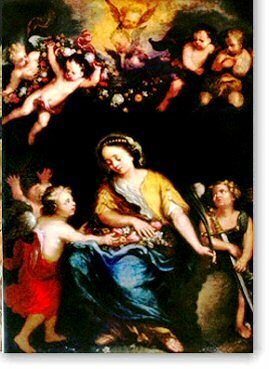 This book is considered the standard guide on the care of old paintings by both private and public owners of pictures. Saint Catherine - Hendrik van Balen (Antwerp 1575-1632) The painting is a lost work by the artist. 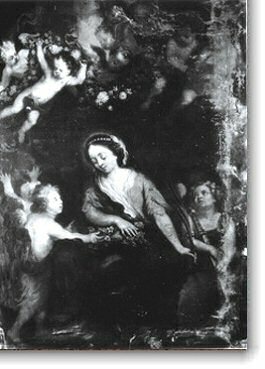 Image shows the painting after its discovery and just before its conservation. The artist is known to have collaborated with Peter Paul Rubens, Anthony Van Dyck (who had been his pupil) and Jan Brueghel de Velours. Saint Catherine - Hendrik van Balen (Antwerp 1575-1632) Detail of the painting during the first stage of conservation. 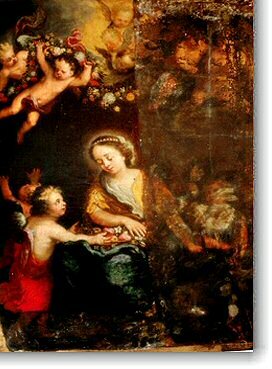 some of the ancient varnish has been removed from the Cherubs in the top left of the canvas. 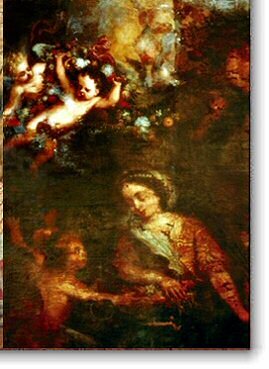 Saint Catherine - Hendrik van Balen (Antwerp 1575-1632) As the conservation proceeds the beauties of the Old Master, for long concealed beneath the oxidized varnish reveals the figure of Catherine and, on the left, the Rubens-like cherub. Saint Catherine - Hendrik van Balen (Antwerp 1575-1632). After the final phase of conservation, Hendrik van Balen's Masterpiece is revealed in all of its original beauty.